There's nothing more frustrating that having to look at 1000s of lines of Java code, to find the cause of a Null Pointer Exception (NullPointerException). If you know what you're doing, it's usually not too much of a problem; A little understanding of Java Classes and Exceptions goes a long way to helping. This is as much a Java lesson than it is Talend. A data item within your Talend Job may be stored as a Literal, a Primitive Type Variables or a Class Instance Variable, representing an Object of a particular Class. Generally speaking, Literals are to be avoided; that is, a value has been hard-coded in to your source code. In the following code-fragment, "Hello World!" is a Literal. String message = "Hello World!" Variables can represent data using Java Primitive Types. A Class Instance Variable is a Pointers to an instance of an Object, whose type is Class, for example, String. In the following example, the Class Instance Variable mYString is a Pointers to an Object of the type String. Primitive Type Variable or Class Instance Variable? Certain data types may be stored as either Primitive Types or Objects. Have you ever noticed in a Talend Schema that integer data types, for example, are shown as int | Integer. Why is this? An integer can be stored as either a Primitive Type (int) or an Object (Integer). From an efficiency stand point, data is best stored as int, however, one important value that cannot be represented by int is null; if you assign no value, then the value of int is zero. If you define a column as Nullable in your Schema, then an Integer type is used i.e. you need to be able to store a null value; otherwise, an int will be used. When we're talking about null-handling in Talend (Java); we are specifically talking about handling Class Instance Variables (Objects) that are Null-pointers. If you attempt to call a Method of Class Instance Variable that is a Null-pointers, Java will throw a Null Pointer Exception (NullPointerException). 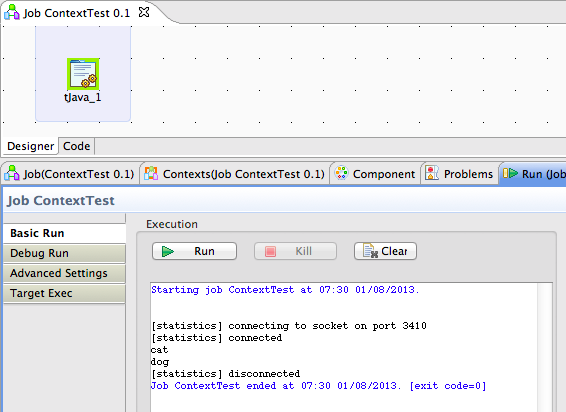 Talend provides the Routine (routines.Relational) public static boolean ISNULL(Object variable); which makes the same == test, as that shown above. It is good practice to always test for a Null-pointers, before using an Object. In these two, albeit unrealistic, examples, the first will throw a Null Pointer Exception (NullPointerException). A zero-length String is something you will often want to handle, often converting it to a Null-pointer. Take an example where you are reading a CSV file and writing it to a MySQL Database. When a string input from your CSV file is zero-length, it is sensible to store this as a NULL value in your database. The following Mapping Expression shows how you might handle this. You may, of course, want to wrap-up the above statement in to a Routine. When you create a new Context Variable, Talend assigns a Default value of null, as shown in the screenshot below. At first glance, you may think that Talend is doing this to show that the Context Variable is, in fact, a Null-pointers; however, this is not the case. Talend has actually assigned "null" as a value. If you remove this default value, the Context Variable will then become a zero-length String. To my mind, this is an unhelpful bug. The other interesting observation with a Context Variable, is that when assigning values in the Contexts Tab, double-quoting is optional, as demonstrated below.